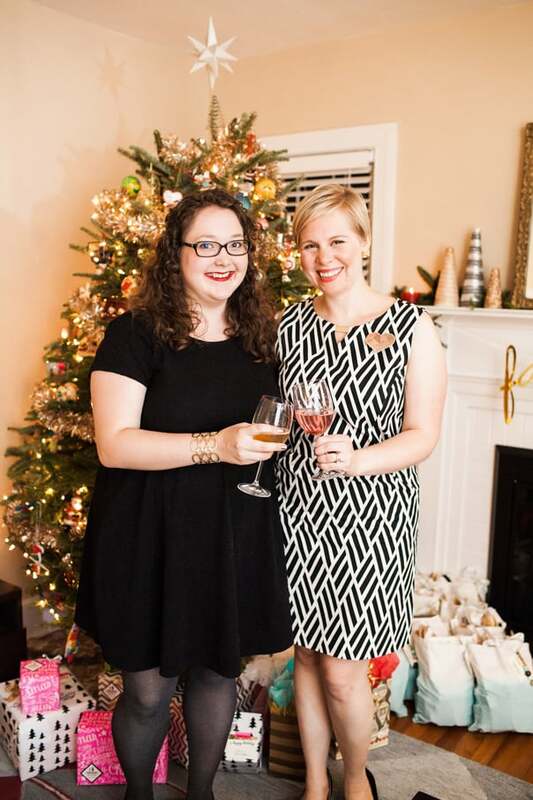 A few months back, my friend Katie approached me about co-hosting a holiday party for our blogging friends. 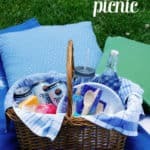 I have really loved collaborating with Katie on other projects, such as our summer picnic series, so of course I said yes! 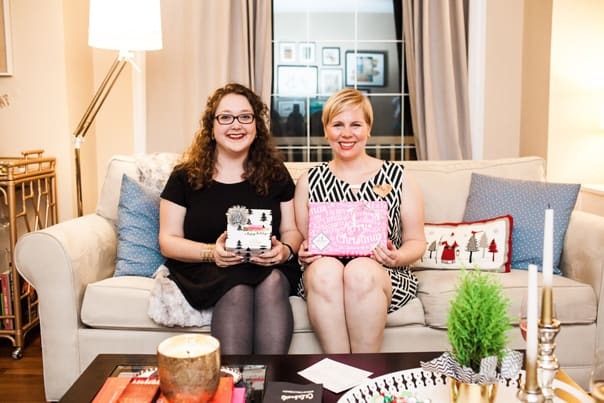 Katie offered to host our Bright Blog Bash at her adorable home in Greensboro, N.C. and I’d take care of the food. 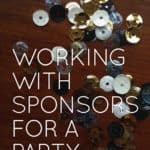 We both worked in our spare time for a couple of months to design invitations, coordinate our awesome sponsors and plan a festive menu. The party took place the weekend before Thanksgiving, and I drove to Greensboro a day before the party to help Katie and her husband pack swag bags, prepare food and otherwise get ready for the event. We had so much fun planning together. 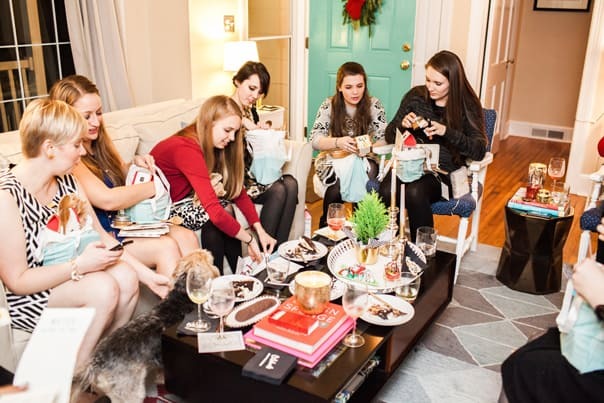 Katie and I will each be sharing details from the party all week on our blogs, but today we are each sharing a recap of the event — here is Katie’s. 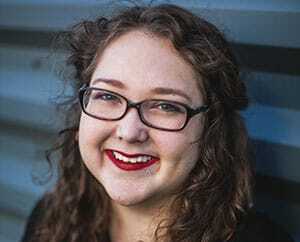 All photos are by the lovely Sara Logan Photography. 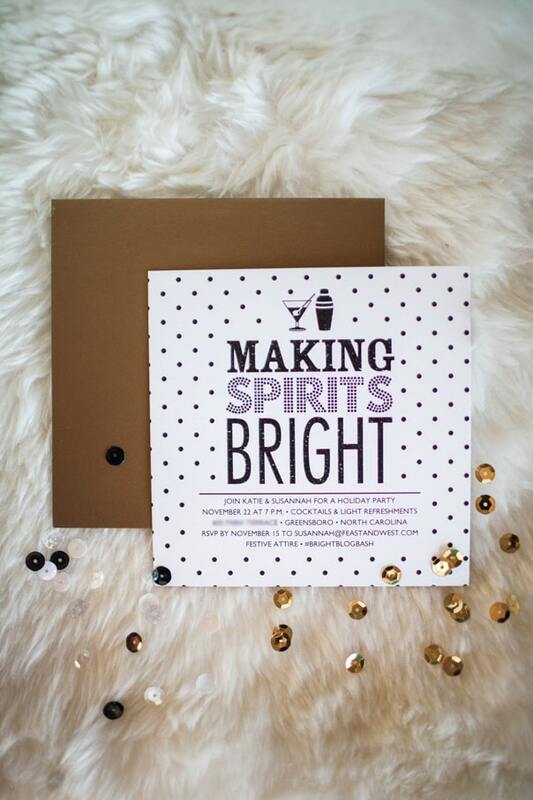 The invitations are from Tiny Prints, who provided many of the paper goods for the party. 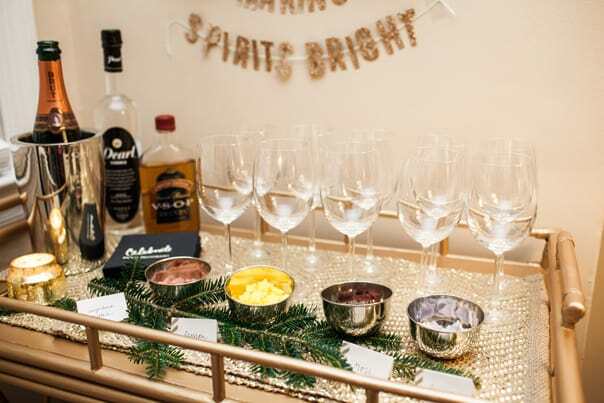 Katie and I chose the Stirring Spirits design, which joined our mutual love for graphic patterns and cocktails. 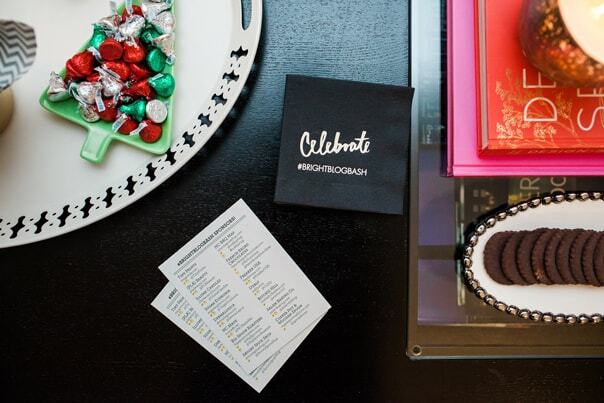 Black, white and gold became our color scheme for the party, and I enclosed a handful of sequins with each invitation for a festive surprise. Isn’t Katie’s home stunning? 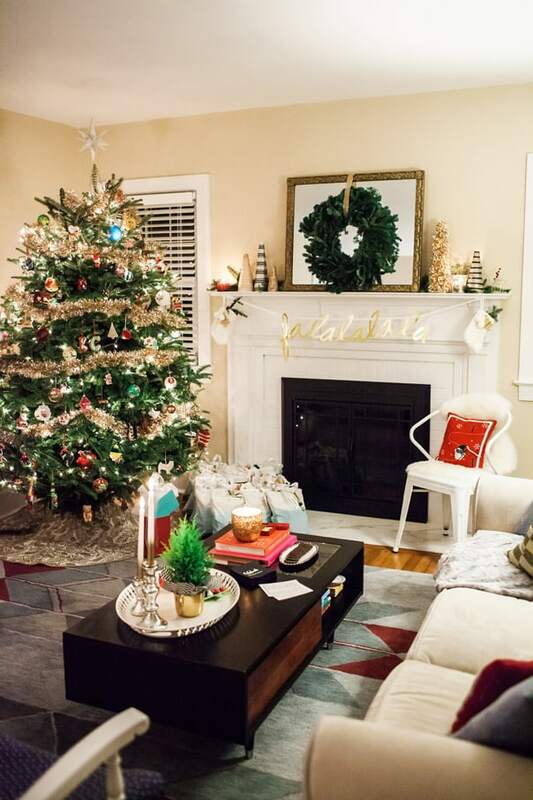 She and her husband picked out their Christmas tree at a farm in Boone, N.C. the weekend before the party, and they took great care in decorating their home for the holidays. 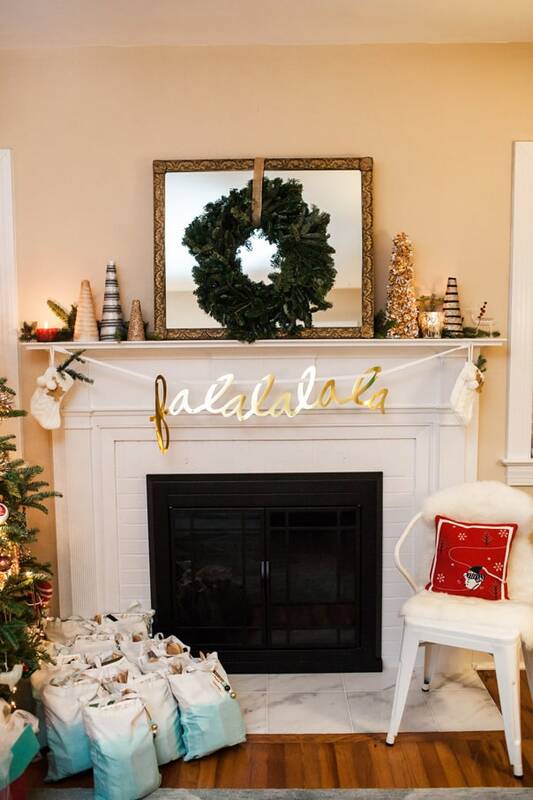 The metallic details she incorporated into the decor really tied into the theme of the party, like that darling Falalalala banner from the Oh Joy! for Target collection. 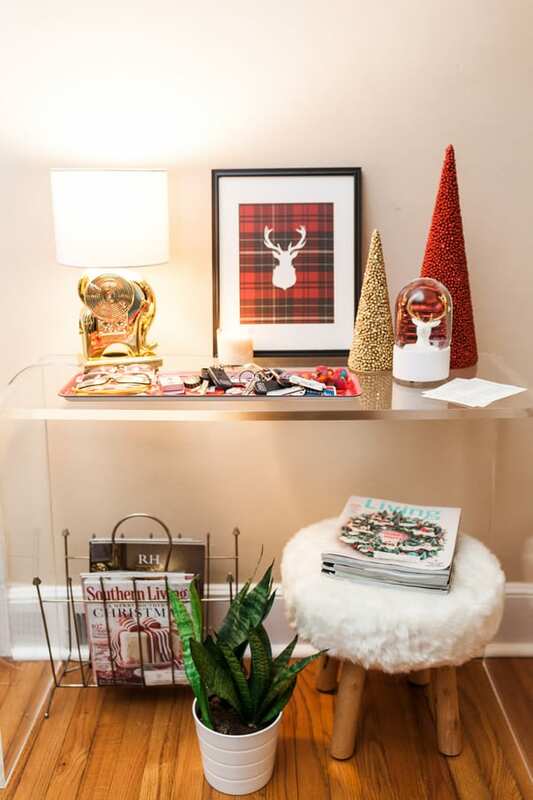 Katie will be telling us how she made those gorgeous trees on her mantel on her blog later this week! 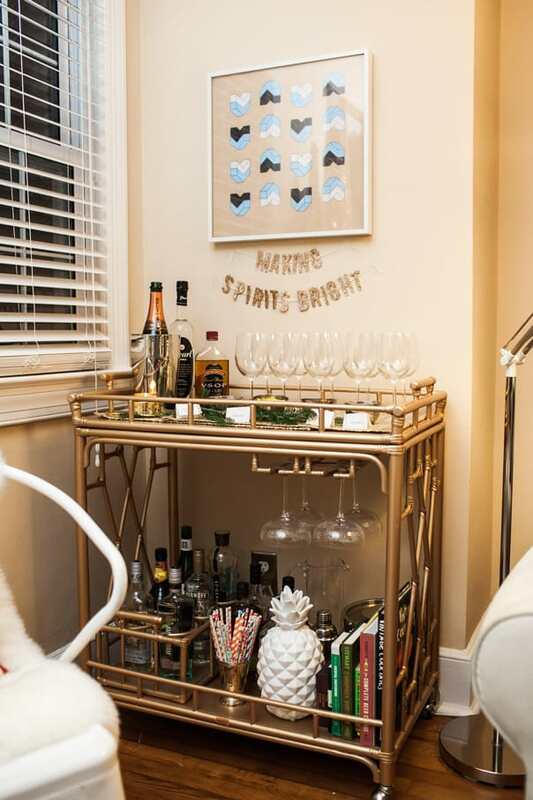 Katie put me in charge of cocktails and I decided to design a champagne cocktail bar for the party. I made four different flavors of sugar cube stars to drop in glasses of bubbly prosecco and sparkling cider. 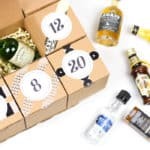 It was a great way to give people a choice of drink without breaking the bank, and it fit in perfectly with our theme of ‘making spirits bright.’ I’ll share the recipe for this cocktail later this week! Now, let’s talk about food. 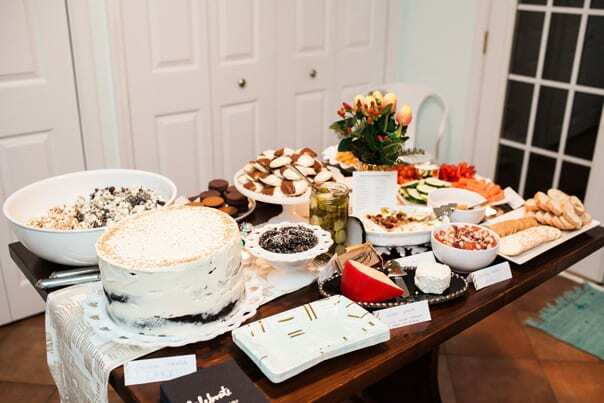 Our sponsors provided some mighty amazing eats for the party. Sugar Euphoria in Raleigh made a stunning flour-less chocolate cake with gold sprinkles on top. It was rich and fudge-y and everything you’d want in a party cake! Our friends at Winston-Salem’s Salem Baking Co. provided dozens of mint chocolate and ginger spice cookies to munch on — always a holiday pick at my house. Waynesville, N.C.-based Copper Pot & Wooden Spoon sent us a big jar of their yummy Dill Pickle Chips to serve alongside our savory spread. 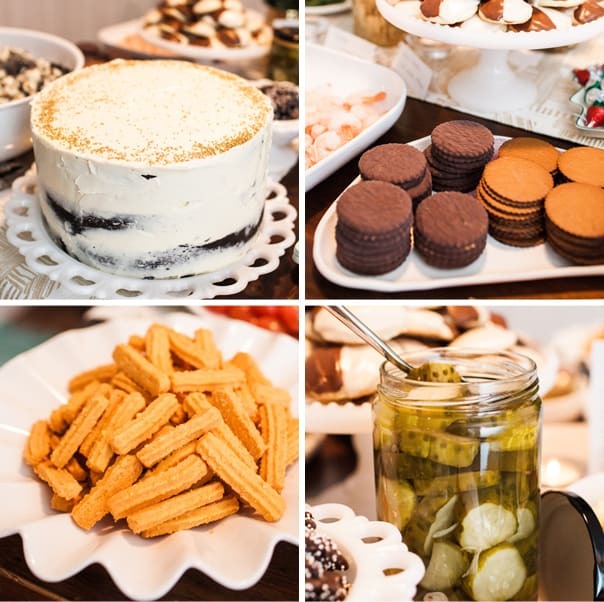 A personal favorite were the crisp, spicy, Southern-style cheese straws from Ritchie Hill Bakery in Concord, N.C.
Click below to see more about the Bright Blog Bash! In addition to our sponsored goodies, I made mini black-and-white cookies and two kinds of dessert popcorn. One was my sea salt caramel popcorn, and the other a cookies and cream popcorn. (I’ll share the recipe for that this week!) In addition to sweets, we also provided a veggie plate, hummus, baked brie, a cheese plate and a white bean crostini. Katie and I picked up these gorgeous tulips, berries and greenery from Whole Foods for the floral arrangements we placed around the house. 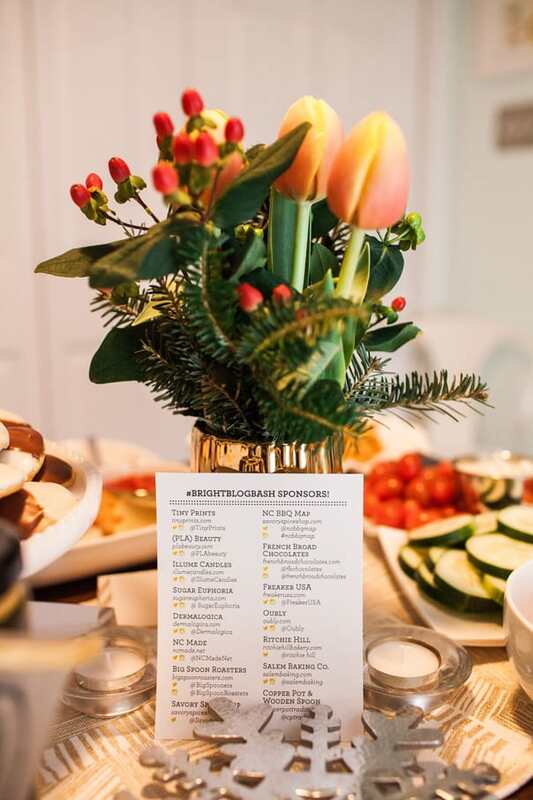 We designed and printed cards with all of our sponsors’ social media information and scattered them around the party to make it easy for our guests to tag our sponsors on Instagram and Twitter. 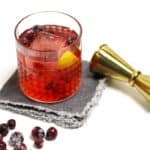 Tiny Prints provided cocktail napkins in Sheer Brilliance. 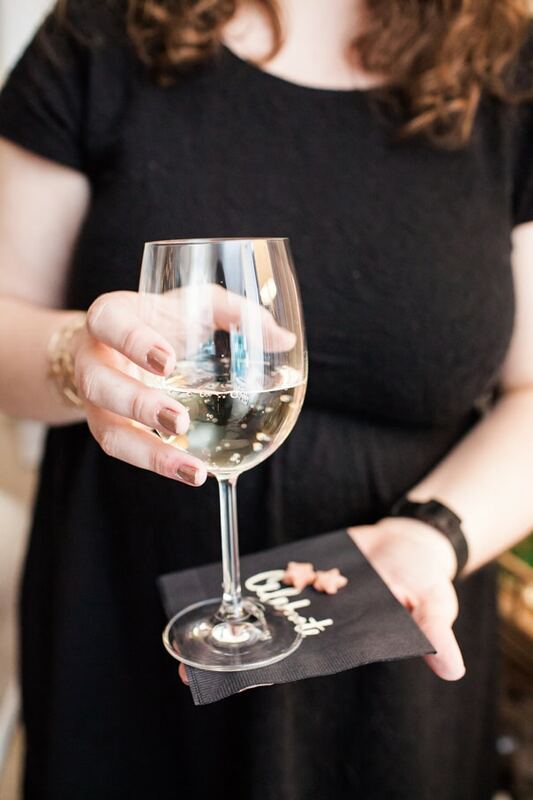 We had them printed with our party’s hashtag — #brightblogbash —subtly reminding and encouraging our guests it was OK to tweet and post photos during the party. 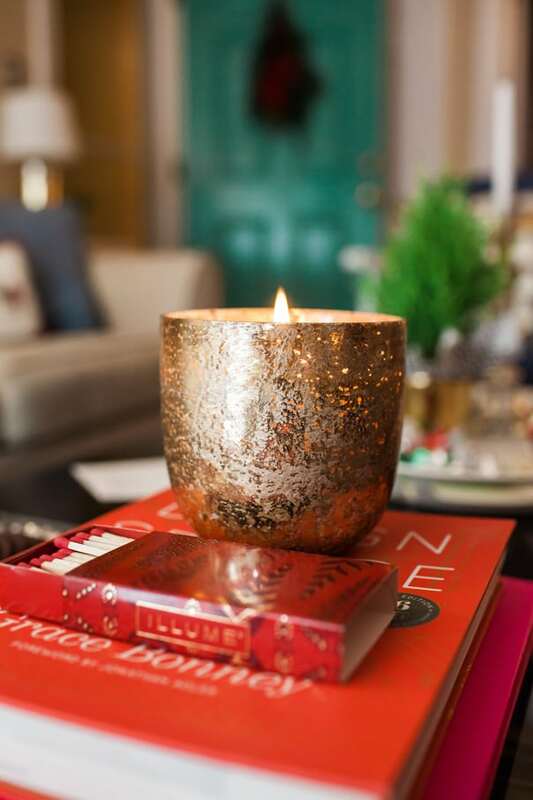 We lit these fragrant mercury glass candles provided by Illume Candles in Gilded Amberleaf, Balsam and Cedar and Noble Currant. 1. French Broad Chocolates: Fresh Raspberry Truffle and Dark Chocolate Salted Honey Caramel. Illume Candles: Demi Boxed Candle. Ritchie Hill Bakery: Heath’s Cheese Straws. // 2. NC MADE: Raw North Carolina Honey. Big Spoon Roasters: Peanut Pecan Butter. 3. PLA Beauty: Glam Lip Gloss. Dermalogica: ‘Our Favorites’ Gift Set. // 4. Freaker USA: Cackalacky drink cozy. 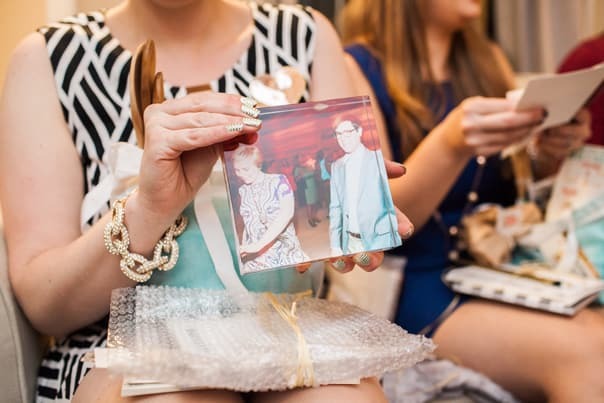 Tiny Prints: Favorite Memory acrylic photo block. Copper Pot & Wooden Spoon: Strawberry Rhubarb Jam. 5. NC BBQ Map. 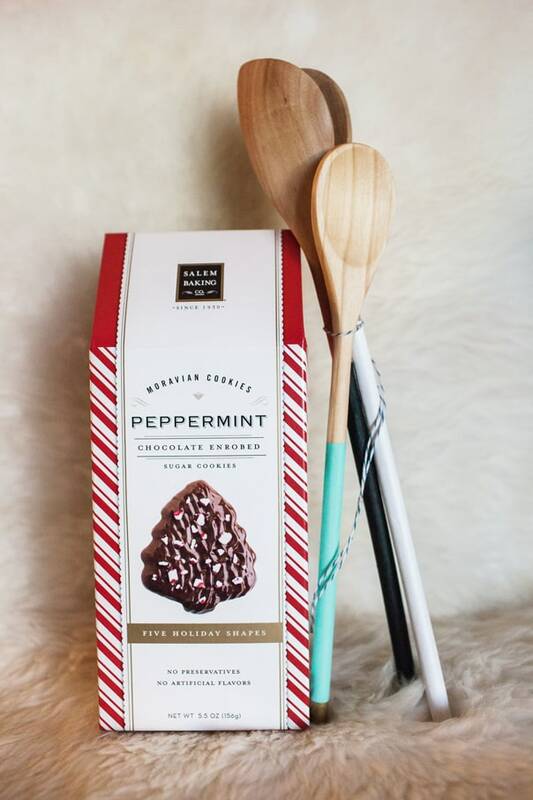 Savory Spice Shop: Black Pepper Mint Chocolate Sugar. // 6. Tiny Prints: Glamorous Stripes personalized notepads. Oubly: New Squares note cards. 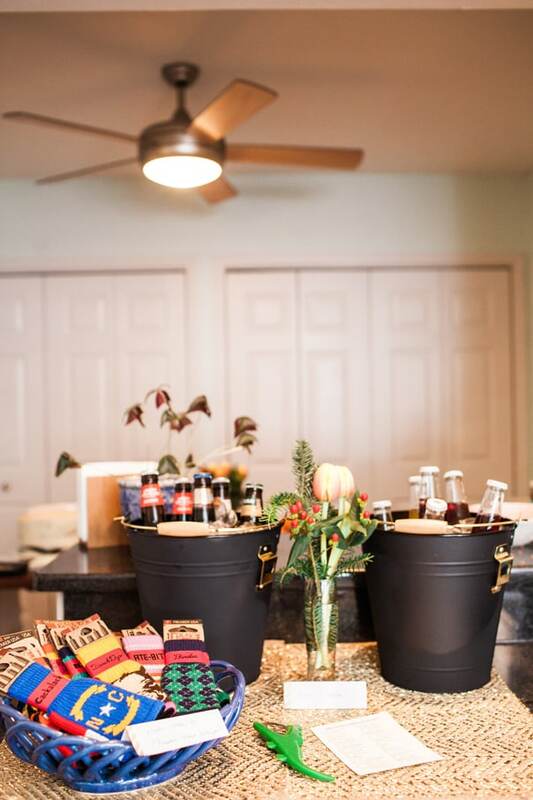 Katie and I worked to make sure we included lots of handmade elements into the party, right down to the gift bags. 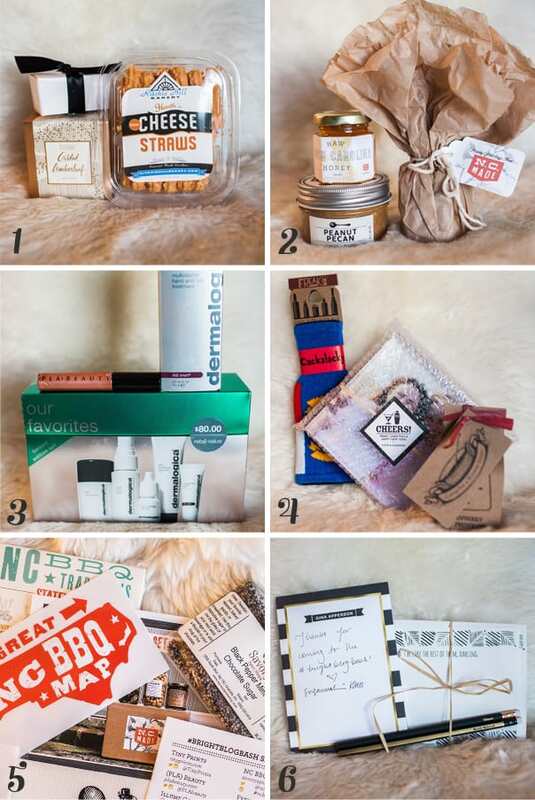 We also wanted to include a handmade gift from us to our friends among our sponsors’ gifts. Katie’s gift was the gift bag itself, which she dyed in a lovely mint color. (She’ll be sharing a how she did that on her blog this week.) My handmade gift was a set of three hand-painted wooden spoons. I will be posting more about these later this week too! They’re pictured here with peppermint chocolate cookies from Salem Baking Co. that were also in the gift bags. 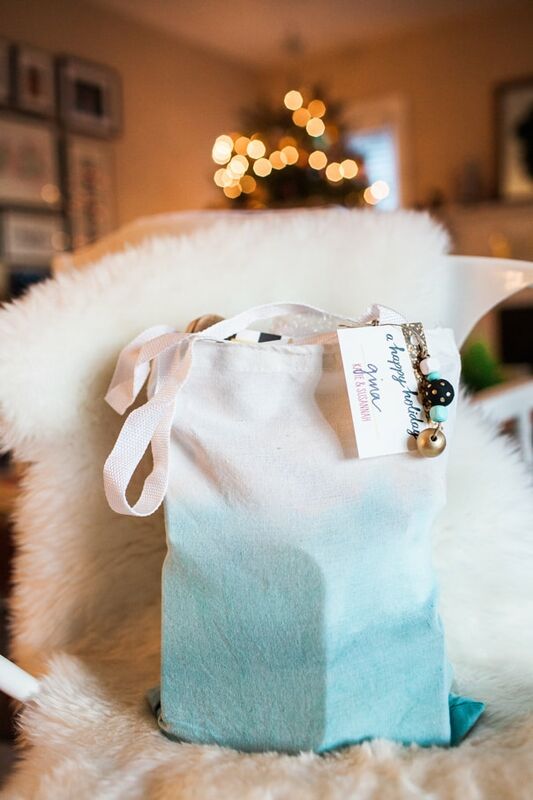 The gift tags are Sparkling Excitement from Tiny Prints. Susannah, this party looks like such a festive bash! I love every single detail (and don’t even get me started on all that gorgeous popcorn :). Thanks Amy! I wish you could have been there. We had so much fun planning it! 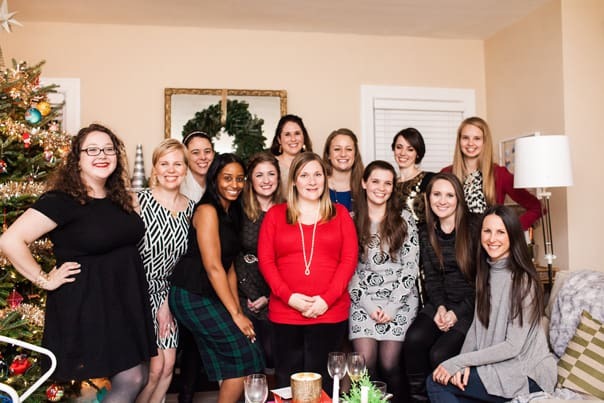 Yay for NC Bloggers! I myself am from Hickory, NC just an hour outside Charlotte! I cannot get over just how stunning everything was from this event. Beautiful job ladies. Hi Laura! Thanks so much for stopping by. I really love stopping by Hickory from time to time! I really appreciate your sweet comments on this. We had so much fun planning it! Thanks for sharing this wonderful write up, Susannah! I loved reading about how you and Katie made this party happen, not to mention seeing some of Sara’s lovely photos. Thanks so much for inviting me to be a part of this fun evening.